Ed. Read The New Defense (Part 1) before reading this. This isn't much different than the play I broke down in The New Defense (Part 1), in fact, it's the exact same defense and the exact same offensive play call. But the result is a little different. And that's encouraging. 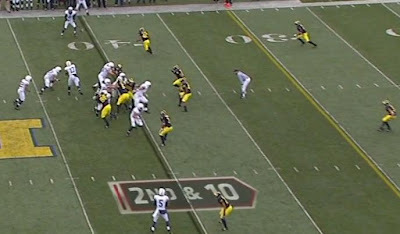 Here's the same alignment by Penn State, only they flipped the field. The tight end is now on the bottom of the screen. Kovacs is shading to the bottom and Woolfolk has man coverage on his wide receiver. Mike Williams is the outside linebacker on the top of the play and Donovan Warren is the corner playing 10 yards off the line. What to watch here is that Williams reacts faster and there's a better result. 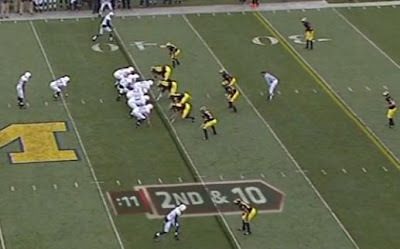 If Michigan can continue to improve, this defense might actually work. Here's the play right after the snap. You can see that Williams is still watching Clark, like he did the first time but is already shading toward the receiver who is sitting down and waiting for the screen pass. The next shot is particularly telling. The ball is in the air here (you can see the spec just above the 0 of the 40 yard line). Most importantly, though, Williams is already starting to run at the receiver. Warren does exactly as well as he did on the last play and is crashing down on the pass. Williams is still a step or two late on this pass, but you can see that he's close and able to make the tackle near the line of scrimmage. Warren looks to be playing cautiously so that if Williams misses the tackle, he hasn't overrun the play. 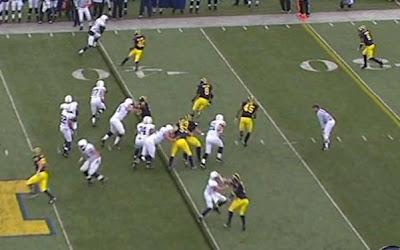 Three yards past the line of scrimmage, Williams has tripped up the wide receiver who rolls for another yard. Warren has successfully kept contain on the play. You can see on film at the end of The New Defense (Part 1) that Greg Robinson grabs Williams after the play and gives him a very specific directive. I assume that this is exactly what he told him. Ezeh and Mouton should be able to give chase if it ends up as a run play, and Williams crashing on that short zone should limit or take away these short passes. Again, empirical improvement in game. This is encouraging. The one problem with this defense, as you might guess, is that it takes arguably our best defensive player (Warren) and mostly neutralizes him. I think the positives and negatives balance out in the end, though. This alignment makes it difficult for Michigan to get beaten on the long ball while, if everyone plays their respective zones correctly, also takes away the short passes. The 4-4 alignment also helps with run defense and puts a lot of players in the box--there's actually a really good breakdown of a similar defensive play call over at Trojan Football Analysis. There are obviously flaws here and Michigan is going to need to work on a few things, but this is mostly encouraging. The final part of the series will be coming around Noon. Where does the defense go from here? Grilled salmon with a side of MOEAKI!!! Boubacar Cissoko off the team? I can has Roses? No. Post-presser thoughts: I can has freshmen? 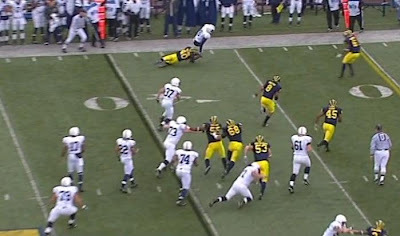 The Denard INT: Whose fault was it?